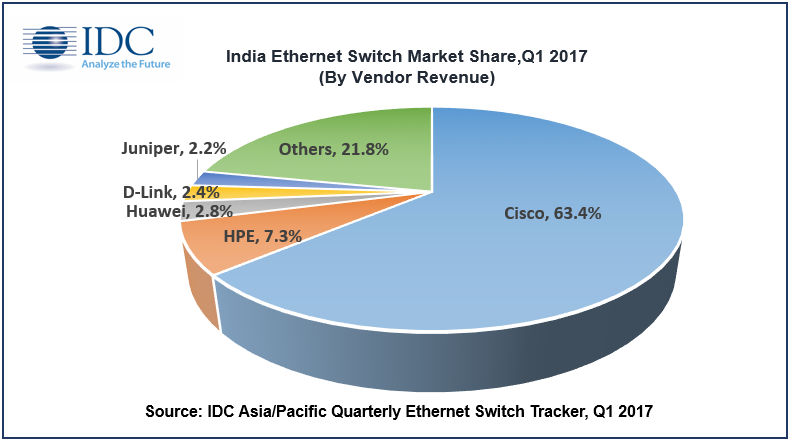 NEW DELHI, July 13th, 2017 –The Ethernet Switch market in India witnessed a year-on-year (YoY) growth of 12.4% in Q1 2017 and stood at USD 126.6 million (by vendor revenue) as per IDC’s latest Asia/Pacific Quarterly Ethernet Switch Tracker, Q1 2017 . Top verticals driving investments in Ethernet Switching market were Telecom, BFSI, Professional Services, Government and Education in Q1 2017. The digitization efforts by the government will continue to pool in investments and propel the growth for the Ethernet switch segment in the Indian market. Cisco retains its dominance in the Ethernet Switch market due to increased spending from both enterprise and service providers' segments in Q1 2017, followed by HPE and Huawei. This quarter the growth in data center has triggered the growth of players such as ODM direct in rising the ladder. 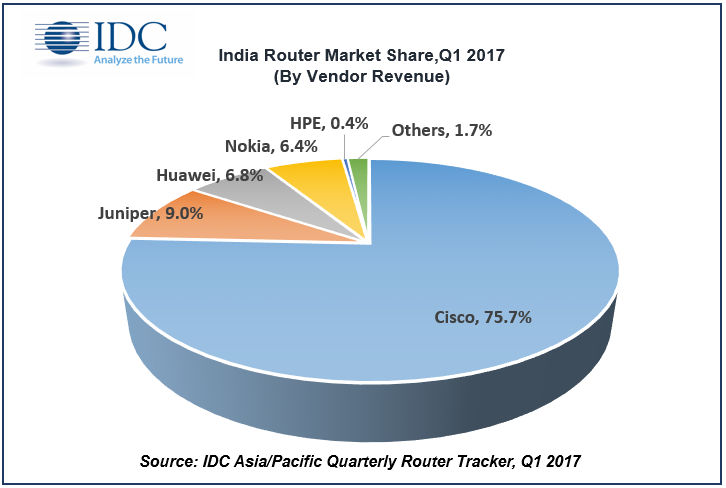 According to IDC’s latest Asia/Pacific Quarterly Router Tracker , Q1 2017 the Router market in India witnessed a YoY growth of 33.5% in Q1 2017 and stood at USD 92.5 million (by vendor revenue). The growth was observed both in the Service provider and the Enterprise deployments. The Service provider segment was driven by the growth in High end routers due to regular refreshes to upgrade the infrastructure requirements driven by the 3G, 4G deployments and Mobile back hauls. This is also dependent on the fact that the service provider segment is becoming more competitive with the growing demand of 4G services. In the Enterprise segment the high-end and mid-range routers were driving the growth. The rising demand for Datacenters and cloud based deployments will propel its growth. Cisco leads the router market in Q1 2017, due to significant uptake of from telecommunication players. Nokia witnessed a strong YoY growth while Huawei saw a YoY decline in Q1 2017. 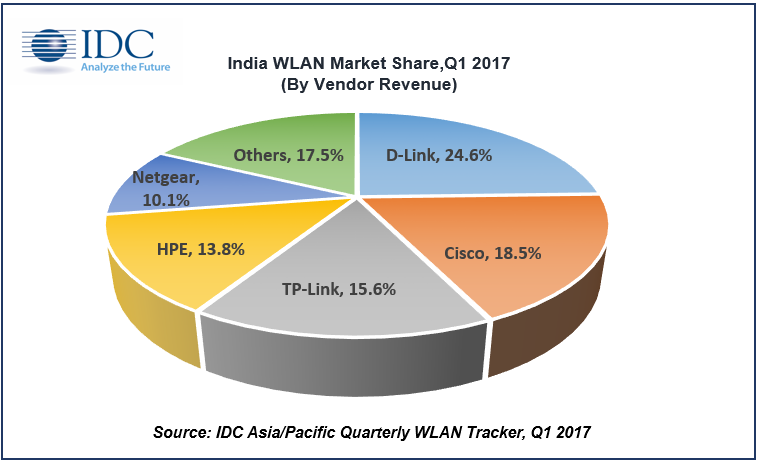 Per IDC’s latest Asia/Pacific Quarterly WLAN Tracker, the WLAN market in India stood at USD 42.3 million (by vendor revenue) in Q1 2017 or a decline of 8.5% compared to Q4 2016. The slow growth was attributed to the dampened demand from all the segments. This quarter all the segments saw a dip as the market slowed down after witnessing a traditional growth/spike during the last quarter. Education, Business Services, and Government were the key contributors in the Enterprise segment this quarter. D-Link retains its top spot in Q1 2017, predominantly due to contribution from gateway router product category. In Enterprise deployment segment, Cisco leads followed by HPE in Q1 2017. “The Digitization efforts by the government will continue to have a positive impact on the networking market. The various smart city projects have laid a foundation to create a digital ecosystem highlighting the need to upgrade the current network infrastructure requirement. The various private and government players are contributing towards increasing the digital footprint." The Ethernet Switch, Router and WLAN market are expected to grow in single digits in terms of compound annual growth rate (CAGR) for 2016–2021. Education and Government will continue to be the key drivers attracting investments in WLAN market.